If yesterday's game didn't play out like it did, Mark Teixeira's hamstring injury — one that sidelines a player for six to eight weeks — would have required the Yankees to replace him the lineup for all of one game, the one that could have ended their season. But the Yankees' bats came alive, they won to force a Game 6 in Texas, and life without Teixeira will continue for at least one more game. 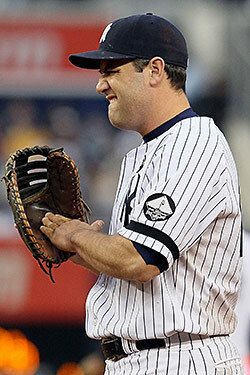 Lance Berkman, who'd settled into the role of a part-time DH platooning with Marcus Thames, suddenly will play a much bigger part as the starting first-baseman — especially since Joe Girardi appears hesitant to sit Berkman and use Nick Swisher at first against lefties. Which means there isn't much of a ripple effect defensively: Swisher will remain in right, and Austin Kearns — a candidate to see playing time in the outfield, if a spot had opened up — will remain on the bench. But Teixeira's absence means changes to the batting order, too, and while Teixeira's glove will be missed, it's a sad truth that the bat he'd been swinging lately won't be. Another postseason that started out so promisingly turned ugly: Teixeira did not record a single hit during the ALCS. And while, over any substantial period of time, Teixeira belongs in the three hole, and would be given as much time he needed to get right — it's safe to say Girardi wouldn't pull a Torre and bat him eighth — batting Robinson Cano (he of the 1.555 ALCS OPS) in that No. 3 spot right now really isn't such a bad thing.